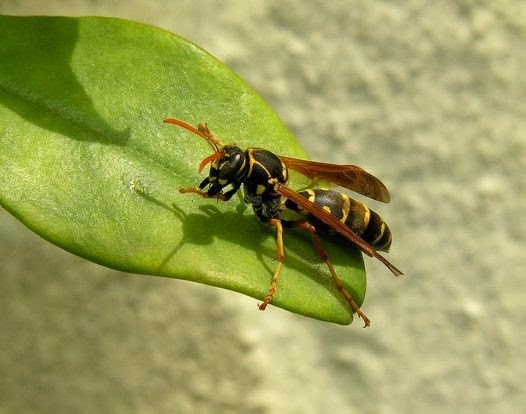 Native paper wasps are smaller than European Wasps, and lack their vivid yellow markings. They tend to only be aggressive when defending their nests (personally found this out when trimming recently) and are otherwise beneficial insects to have around the garden. There are as many as 21 different paper wasps. Paper wasps have a small head, with medium sized eyes and medium length antennae. The body is slender with a very narrow waist. There are two pairs of brown-tinted wings, with the first pair larger. The abdomen has some yellow/orange bands, but is mainly black.You will recognise them by their long, narrow bodies and their conical, gray, paper nests. Unlike bees, wasps are not hairy. The adult paper wasps catch caterpillars to feed the larvae, but the adults themselves feed on nectar. The nest of the paper wasp is a series of cells shaped like an inverted cone made from saliva mixed with wood fragments. When it dries the mixture is quite paper-like and gives these wasps their name.